Printable calendars may seem at the opposite end of scheduling apps, drive documents, online synced planners and smartphone reminders. Calendars may be the tools you need to turn time chaos into management. There are many reasons why paper calendars stand out in businessmen’s offices. Below we will outline the main advantages of such productivity tools and how to use them to make the most of your work. This is, of course if you choose the right template. Before discussing about the effects of printed calendar of your work time, make sure you choose a suitable template. The most helpful template needs to outline your main unavailable work time – weekends – without being too charged with information. Simple and elegant templates also impress in meetings. Also, when downloading a template also look for calendar printouts for past months and consider reviewing your past recent activity. Printed calendars aren’t technology-dependent. You can see them without needing to wait for phone or computer use. You can access your schedule whenever you want to, without logging in, adding passwords, waiting for system updates or for power to get back in function. You have instant access to the information from the calendar. However, the scenario that you have little battery left and must open an app to see your schedule is possible. While looking for a charger, you may also hope you get to see the info before your smartphone shuts down. This is what the calendar saves you from. Cloud systems and software-based technologies are exposed to data alteration. You or the colleagues you share it with might accidentally alter the calendar content or expose it to risks. The data you write in your calendar is not editable. You rarely can modify your marks, if you choose to write them using a pencil. When an event or a project is no longer necessary, you can mark it with a specific symbol to use for all changes of this kind. 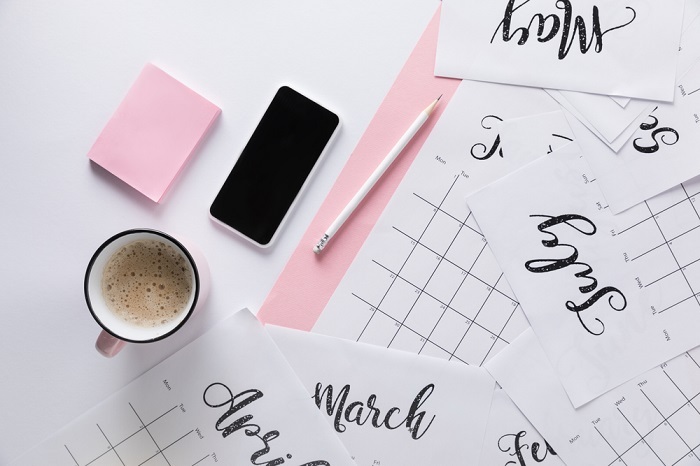 By keeping calendars of the past months, you can evaluate your past work and develop strategies to optimize your time. To have a clear view on your future work tasks, you only need to print future months’ calendars. If there are any possible schedule modifications due to emergencies. The paper calendar first saves you of learning time, as there’s no acknowledgment process involved. You only need to write on it depending on your style. Therefore, there’s no initiation process as with regular software. The only time you need for the calendar is to define your color code and symbols for specific notes. By color coding or developing signs, you can organize your work thoroughly. You can mark deadlines, recurring tasks and urgent meetings based on your notes. Also, by including your own time – such as vacations and National Holidays you can have a clear view on how many days you work during a month. However, take note that the calendar is not a to-do-list. Don’t overcharge it with tasks that last less than 4 – 8 hours. You use this tool to see what changes might occur into your regular workflow. Remember this before making notes in the calendar. Don’t use sticky notes next to the calendar. One additional note will lead to another and you risk overcharging your tool with information that makes it less accessible. Remember your own time. As a day’s work also involves breaks and the perspective of hours when you cannot work, so is your month. You don’t need to schedule each working day, as you also handle regular tasks that take time. Also, update your calendar info with days off, trips and internal meetings or team buildings. Create a weekly ritual for your calendar. Check the information on the calendar weekly. See what you need to update, mark as completed, postpone or even cancel. Without a ritual, you might forget to adjust it to changes you don’t write down immediately. Calendars make reliable long-term tools for your schedule. You will see changes in productivity, time management and business communication. Printable calendars are versatile and reliable. For backup purposes, you should keep the last months’ sheets at hand. Also, you should have a specific folder for calendar documents and easily print them when in need. Printable calendars can be used for work and home use. Your partner might find it useful to keep the household organized. Therefore, you can choose to rely on your calendar on the long run and notice changes.